"MTV", "We", "us" and "our" means MTV Networks Africa (Pty) Ltd of 1 Saxon Road, Hyde Park, Johannesburg, 2196. All rights, title and interest in Intellectual Property Rights in the Site including without limitation games, ringtones, data, software, design, text, images, photographs, illustrations, audio-clips, video-clips, screen savers, artwork, graphic material or other elements (the "Material") are the property of MTV and/or its associated companies, and/or its licensors and/or other respective owners and are protected under English and foreign Intellectual Property Rights laws. You agree not to copy, reproduce, modify, create derivative works from, display, perform, publish, distribute, disseminate, broadcast, transmit, sell, rent, lease, lend, sub-licence or circulate any Material and/or part of or all of the Site to any third party (including, without limitation, the display and distribution of the Material via a third party website) without our express prior written consent. Use of MTV’s and/or our licensors' Material is only permitted with our express prior written permission. Where we provide areas of the Site to allow users to post and exchange information, ideas and opinions ("Postings"), or other material including without limitation text, images, designs, audio and/or video clips (“Submissions”), the Postings and/or Submissions are the views and opinions of you and other contributors to the Site. In no event will we assume any responsibility or liability for any Postings or Submissions nor will we represent or endorse the accuracy or reliability of any advice, opinion, statement, suggestion or other information on the Postings or Submissions nor will we be liable for any loss or damages resulting from their use and/or appearance on the Site. In consideration of using the Site you grant us and our associated companies a free of charge, perpetual, worldwide, royalty-free, irrevocable, non-exclusive licence to use, as we, in our discretion see fit, any information (in addition to Postings and Submissions) submitted by you to the Site (whether at our invitation or on an unsolicited basis). Such use may include, but is not limited to reproducing, editing, licensing, copying, adapting, transmitting, broadcasting, publishing or deleting. You undertake, represent and warrant to us that any Posting or Submission is original to you and does not infringe any rights of any third party. You also agree to assign any copyright, performance rights all other rights, titles and interests in any such Posting or Submission in relation to its use by us (and this assignment shall operate to the extent necessary as a present assignment of future rights). You further agree to offer all reasonable assistance to us, and to execute all documents necessary, to effect any such assignment. If you are between the ages of 14 – 18, we will need your parents or legal guardians consent. We will make every effort to ensure that the Site best serves your interests and those of all users and, therefore, we will have the right to monitor, remove, suspend, destroy, use and change any Posting and/or Submission in any manner that we think necessary at any time. We provide additional terms and conditions for certain activities on the Site, including for competitions, provided by us and/or other third parties. These Conditions of Use are incorporated into those specific terms and conditions provided in respect of a particular activity. In the event of any conflict, the specific terms and conditions provided for the activity you have chosen will take precedence. You can look at our Competition Rules here [insert link to Competition Rules]. The Site and all Materials contained in it are distributed and transmitted by us on an "as is" and "as available" basis. Except to the extent required by law, MTV including its associated companies, its directors, employees, agents or sub-contractors (1) disclaims any and all express or implied representations, warranties and/or conditions of any kind, including, but not limited to the implied conditions and/or warranties of satisfactory quality, fitness for purpose, non-infringement, compatibility, security and/or accuracy; (2) is not responsible or liable for any infection or contamination of your system arising out of or in connection with your use of the Site or any connected website and does not warrant that the Site, the server(s) that make the Site available or any connected website are free from viruses, trojan horses, worms, software bombs or similar items or processes or other harmful components; (3) is not responsible or liable for interruptions, delays, inaccuracies, errors, or omissions arising out of your use of the Site or any connected website or with respect to the Material, Postings or submissions contained on the Site; and (4) does not warrant that the Site, or any connected website, any materials, third party content, goods and services offered will be uninterrupted or error free. (6) wasted or lost management time, even if advised of the possibility of such loss or damage or if such loss or damage was foreseeable. Notwithstanding the foregoing, in no event shall our liability to you for any and all losses or damages (whether in contract, tort, breach of statutory duty or otherwise) exceed the amount paid by you, if any, for accessing the Site. You agree to fully indemnify, defend and hold harmless MTV, its associated companies, its directors, employees, agents, licensors, representatives and third party providers from and against all loss and damages including reasonable legal fees, resulting from any breach of these Conditions of Use by you. We reserve the right to assume, at our sole expense, the exclusive defence and control of any matter subject to full indemnity by you, in which event you agree to fully co-operate with us in defending any action or potential action. 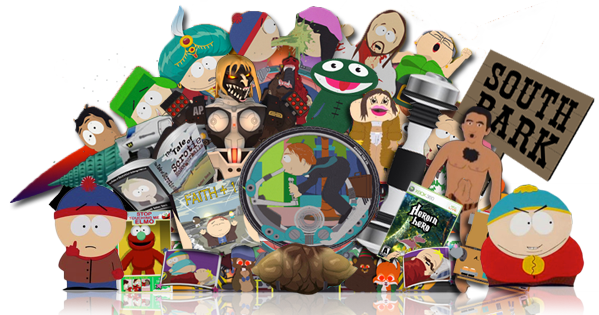 All South Park props available to order on the www.ownapieceofsouthpark.com will be given to consumers on a first come first serve basis. Items limited to one per person. All props are replicas of the actual paper cutouts used in the show. Users who are the first to claim a prop will be sent a card board cutout of the prop they ordered online to the physical address they entered in the online submission form.